Ella Health has always offered 3D mammography, which is the most advanced breast cancer screening exam available. We chose it because we wanted women to have peace of mind. Our radiologists have seen over and over that it provides a more comprehensive and clearer picture. A 46 y/o woman presents for yearly screening mammography. The 3D mammogram revealed a 15 mm mass (see circle), which is hidden on the standard 2D mammogram. Biopsy revealed invasive ductal carcinoma. With this enhanced imaging, radiologists are able to find more cancers earlier. Additionally, fewer women are asked to come back for more testing due to uncertainty. 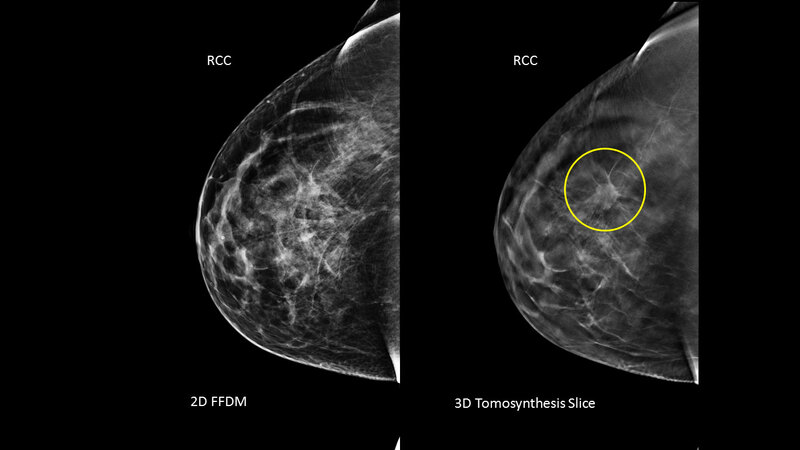 This week, a new study, the largest to date on 3D mammography, confirmed what our radiologists have experienced – 3D is better. The study showed that using 3D imaging increases the detection of cancer by 29 percent. More importantly, the detection of invasive breast cancer improved 41 percent. Also significant, however, is that the number of false positives dropped by 15 percent. A false positive happens when a woman is called back for more testing that shows no sign of disease. “This study confirms what other studies have shown, which is that 3D mammograms are more effective because they provide radiologists with more information,” explained Ella Health Chief Executive Melissa Dyrdahl. “It is important for women to have the peace of mind that they are getting the best exam available. The study, published in the Journal of the American Medical Association. involved nearly half a million women. Five leading academic hospitals participated along with eight community-based sites. The 3D images can be taken at the same time as 2D images during a procedure that takes just seconds longer. The additional images are compiled, allowing radiologists to flip through them like the pages of a book. If they see a suspicious area, they can look closely at the surrounding area to determine if it’s really a concern or just overlapped tissue that can occur with the breast is compressed.